First, can I say that anything cooked in 1 stick of butter has to be good.....right? 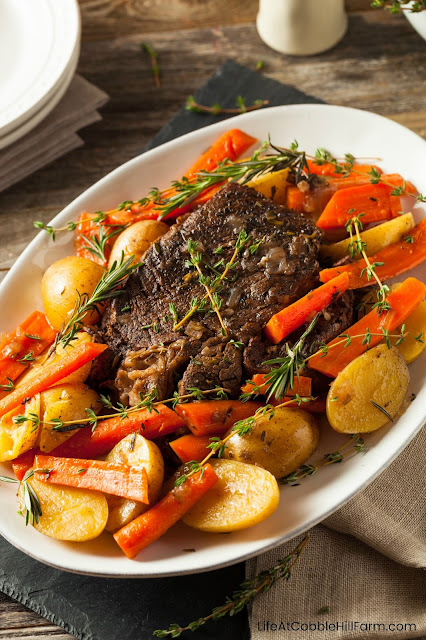 This pot roast is absolutely delicious. The original recipe uses the roast, 1 stick of butter, the pepperoncini, 1 packet of au jus and 1 packet of ranch dressing. I did make it exactly as that but found it way too salty and had just a touch of a chemical flavoring from the packets. It was really good though. My second attempt was adding carrots (because the sauce is so darned good), and substituting the packets with homemade versions of the au jus and the ranch dressing. Yum, but needed a touch more flavor. My third attempt was the same as the second but adjusting the homemade au jus and ranch dressing ever so slightly. This time it was a winner. I was hesitant about even trying this initially because it's such an odd combination and I really dislike ranch dressing. I can assure you that it tastes nothing like ranch dressing. I also wondered about the pepperoncini - it does not make it spicy. I use 4 pepperoncini minced and you just get a bit of the flavor. With the homemade packets I will tell you there's a bit less flavoring, but the salt is controlled and there is absolutely no chemical flavoring. It is still REALLY good. Promise. I separated the au jus and ranch just in case you would prefer to use one of the packets as opposed to the from scratch recipe. This way you'll know which ingredients to cut. If you don't have carrots, don't worry about it but they do turn out yummy. Even my "I don't want any carrots" husband (he says this with every pot roast) enjoyed them. He ate all that I put on his plate! You are reading the recipe correct - there is no liquid added. It makes it's own. Because there is not liquid added, I like to flip the roast 1-2 hours before it's finished to make sure that the entire roast is full of flavor. Not necessary, but recommended. 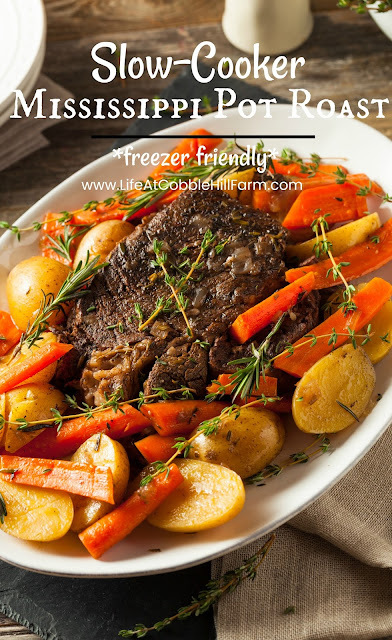 You can easily convert this to a freezer meal by throwing all of the ingredients (not the carrots) into a large freezer bag and freezing. When ready to make, unthaw it in the refrigerator for 24 hours, plop in a slow-cooker and bake as noted below. Easy peasy! Add the carrots to the slow-cooker and then put the roast on top. In small bowls, mix together the au jus, then pour on top of the roast along with the pepperoncini and reserved juice. Mix together the ranch seasoning and sprinkle all over the roast. Top with butter chunks. Cover and cook on low for 10 hours, or until roast easily shreds with a fork. If you can, flip roast after 8 or 9 hours (see note above). Serve. In a large, gallon size, freezer bag, add roast, pepperoncini and reserved juice, au jus and ranch seasoning ingredients. You can also add butter chunks now, or add instructions to add when cooking. Remove as much air as possible from the bag, seal. This sounds SO good! For digestive health reasons my husband went vegetarian a few years ago but I can't resist a good roast from time to time. I'll try this recipe the next time we have family for dinner, they'll love it! It looks fabulous! I can never get a roast truly fall-apart tender, even in the slow cooker...this may be just the recipe I need! Actually, This sounds delicious! I've got an order from Zaycon for chuck roasts coming in May. I can't wait to try it. Although you said to freeze and slow cook it, I wonder if pressure canning would get the same results in jars? I'm going to try it. There's only two of us on this homestead and even a two lb pot roast is 6-8 meals for us. 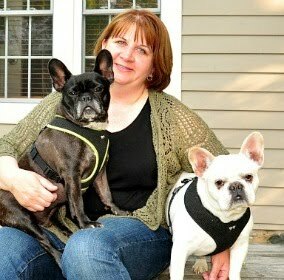 Hi Ashley - I, as well, went vegetarian for health reasons too but I have meat from time-to-time. Your family will love it!! 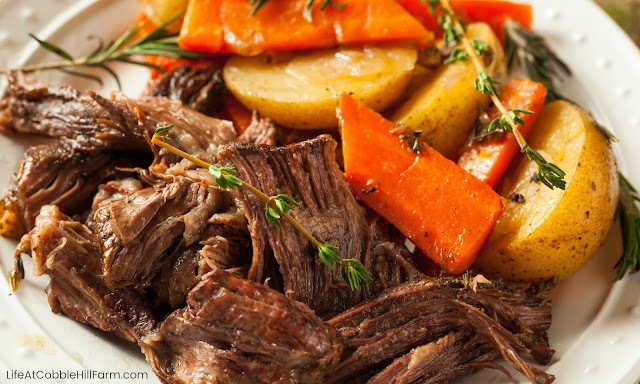 Windy Meadows Farm - have you been cooking your pot roast for 10 hours? So many recipes say to cook them for 8 hours but I've found them to still be tough at 8 hours. I think you will really like this recipe, it's a winner! Cockeyed Homestead - I'm honestly not very familiar with pressure canning. I haven't ventured much into that territory as of yet....I would love to hear from you if you try it though! !